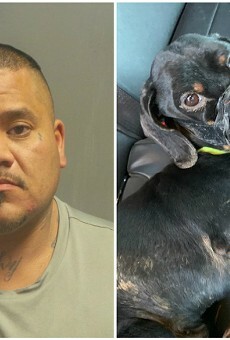 Paul Garcia bound a dog with duct tape and dumped it in a ditch, authorities say. A Jefferson County man accused of abusing and dumping a dog told a detective he thought the dachshund was wearing a camera that was being used by law enforcement to spy on him, authorities say. Paul Garcia, a 39-year-old ex-con with multiple domestic abuse convictions, is facing two felonies in the February 9 incident. Jefferson County Sheriff's Deputy Keith Smith was on patrol that morning when he spotted the dog lying in a ditch in Imperial. 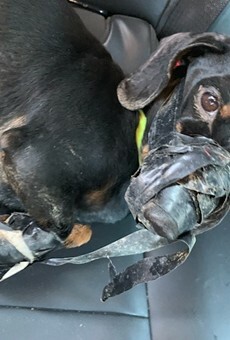 The dog's mouth and legs had been wrapped in electrical and duct tape before he was dumped in the freezing cold, according to a probable cause statement. 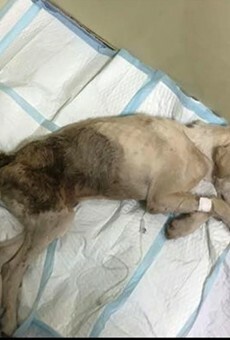 The deputy hurried the dog to the Ivan Veterinary Hospital, carefully bagging and logging the tape as evidence while vets went to work on the abused animal. Detectives Lee Morris and Nich Schuenemann were later able to extract a fingerprint from the tape and connect it to Garcia, according to a sheriff's news release. Detectives brought Garcia in for questioning on February 12. He admitted to binding and dumping the dog, authorities say. The dog did not belong to the ex-con. 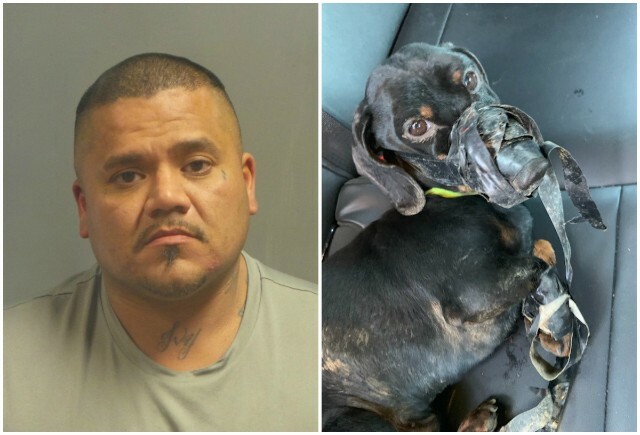 Instead, Garcia claimed he was installing some speakers when the dachshund wandered under his truck, according to the probable cause statement. Garcia reportedly told investigators he panicked, believing the dog was being used to monitor his movements. So he put it in a bucket and wrapped the tape around its mouth and legs. He told detectives he eventually drove the dog to Imperial where he pulled over and threw him out of the window. It was eighteen degrees that night, and when the dog arrived at the animal hospital the next day, his body temperature was five degrees lower than it should have been, authorities say. Staff at the hospital didn't know the dog's name, so they started calling him "Jimmy." On Valentine's Day, the sheriff's office sent out a news release about the case, asking for information. Shortly after, they were able to find Jimmy's owner and learned Jimmy was really named Flick. 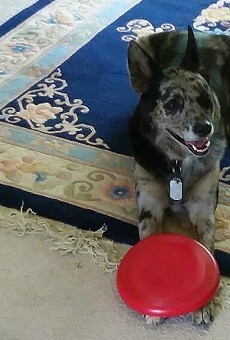 Flick and his owner have since been reunited, and Flick is doing much better. Jefferson County Sheriff Dave Marshak announced today that he had written letters of commendation for Deputy Smith and detectives Morris and Schuenemann for their work on the case. Garcia is being held on $50,000 bond. In the criminal complaint, Assistant Jefferson County Prosecuting Attorney Steven Jerrell notes the ex-con is a prior, persistent offender and is eligible under state law for a more serious prison sentence if convicted. Garcia's past convictions include domestic abuse cases involving at least three different women. Past girlfriends have reported him to police over the years for punching them, pulling them by their hair, threatening them and, in at least one case, threatening a woman's family. Garcia also has convictions for trespassing and one, in 2013, for possessing a chemical with intent to create a controlled substance. He was arrested in 2012 in that case after Jefferson County Sheriff's deputies stopped him with a collection of materials used to make meth.